Songbird is an open-source music player and organizer with which you can manage, play and discover music. It's free, cross-platform and highly customizable thanks to a wide variety of plug-ins and can be improved and extended by the contribution of its user community. The first thing you'll notice about Songbird is its resemblance to the iTunes interface, which means that if you've ever used iTunes you won't have any problem in learning how to use Songbird. Songbird is such a complete tool that's hard to find negative sides to it. Plus there's an army of developers constantly working on improvements and new features. The only thing that's missing is support for podcasts. It should also be noted that with each new release of Songbird, your plugins may be broken by the new release. Songbird plays the Web. Play any MP3 on the Web without leaving the page. 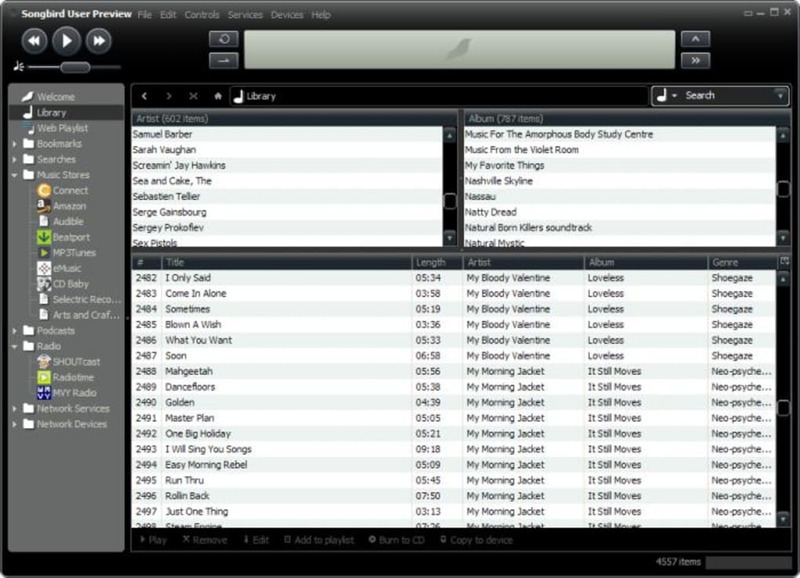 Songbird can view Web pages as dynamic playlists that it can play, save, or automatically download every day. Songbird plays your music too. Songbird has all the features you expect in a desktop media player. And Songbird constantly improves. Like Firefox, Songbird's features may be improved with user installed and contributed cross-platform extensions. Soon, Web page authors will be able to publish playlists and transfer MP3s into Songbird to build digital music stores like eMusic, music subscription services like Yahoo! Music Unlimited, virtual jamming services like Ninjam, playlist sharing services like WebJay and more. Songbird can do everything you'd expect a media player to do. Play music from your computer, as well as from the Web in one integrated user experience. If you run a music service, you can leverage Songbird's APIs to create deeply integrated stores and user features. MP3, AAC, OGG, FLAC, WMA, and more. Can you teach Songbird to sing? Choose from the two included themes: Rubber Ducky or Cardinal Red. You can even make one yourself. Play, Pause, Previous, Next, Volume, Mute, Seek, Three Repeat Modes, and Shuffle. Quickly switch between tasks using the buttons to the right of the dashboard display. Filter your collection by Genre, Artist, Album, and Song or Search-As-You-Type. Songbird will find your music and add it to your collection for you. Use the mini-mode for basic controls while keeping Songbird out of the way. Songbird comes in dozens of languages. Drag-and-drop songs from the Library or another playlist to your create your own custom mixes. Criteria-based playlists that are always up-to-date with your current collection. Get mixes from the Internet and stay up-to-date with the latest updates, downloads, and casts. Songbird plays MP3s without leaving the page. 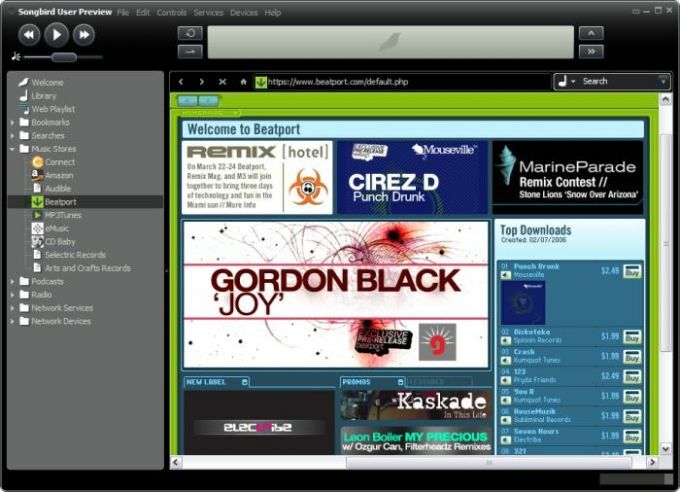 Play web pages as playlists and view any web page as a playlist. 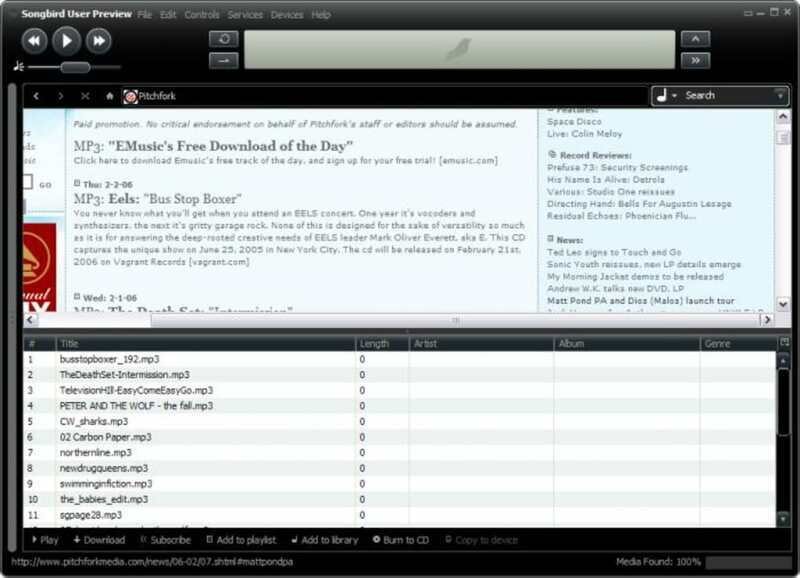 Search the web from the context of your collection or tell Songbird to search on the currently playing track. Coming soon! Have an idea for an extension? Coming soon on Mac OS X, Linux and more. Build deeply integrated web stores into Songbird with Mozilla XUL. Create, populate and play a playlist and much more from your Web site.